You hear a lot. Maybe not quite so brilliantly as Yasuhisa Toyota promised, yet still enough to thrill the experts in the audience. 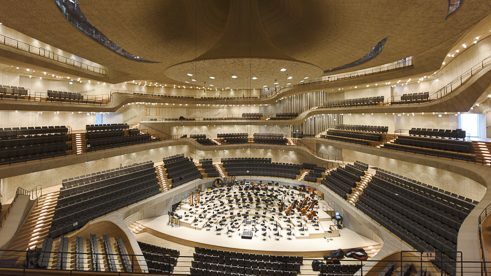 As an example of modern concert hall architecture, the Elbe Philharmonic Hall in Hamburg has therefore proven itself acoustically. But the discussion about the ideal sound continues. 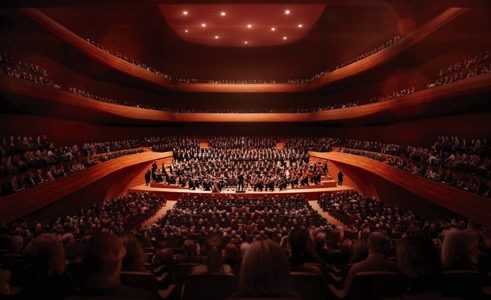 Concert halls are in vogue. Within a twelvemonth, new ones have opened their doors in Bochum, Hamburg, Berlin, Dresden and Künzelsau, while in autumn a decision about a new concert hall was taken in Munich. On the one hand, this trend is about touristic considerations such as the effect of signature buildings, but ideally it primarily concerns the acoustic impact of the hall. “People have to understand: decisive is what is going to happen in the concert hall”, says the chief conductor of the Bavarian Radio Symphony Orchestra Mariss Jansons, one of the driving forces behind the new building plans in Munich, in an interview in the Süddeutsche Zeitung (01.11.2017). “Choosing the right acoustic engineer is a very important step in a successful project.” Because there are many alternatives in the search for a balanced sound that precisely renders the tones produced by the instruments and reproduces them with the right pinch of spatiality. Concert halls have not one room acoustic but three. The most common perspective is that of the audience. The perceived sound of the concert hall serves to round off the artistic experience and set the right framework. A second room acoustic sounds in the ear of the conductor. He stands directly in front of the musicians and therefore hears a much stronger, louder and more powerful sound than the audience. In close proximity to the orchestra, the various distances between the various groups of instruments have a more marked effect; the mixing ratio of the individual instruments with each other is therefore different for the conductor than for the audience. The special task of the conductor is to overhear, follow and conduct in accordance with this difference, so that the sound is optimal not only at the conductor’s stand but also for the audience. The third acoustic characteristic of a concert hall concerns the musicians amongst themselves. This is not so much about aesthetics as about technical demands. To synchronize the playing requires the precise audibility of all instrument groups to each other. Because of the mutual masking and overlaying of sound, the supporting sound reflections of the podium border and the ceiling are essential to achieving this audibility. The interplay between orchestra and space develops differently in concert halls with a rather dry and sober character than in one saturated in an ambience of rich musical sound. This can mean that, especially in new halls, the optimal interplay of space, conductor and orchestra comes about only after a phase of familiarization, both on the part of the audience and of the musicians. Originally, rooms were not specially designed with acoustics qualities in mind, but rather were built according to functional requirements based on experience. Exemplary halls boasting a good sound were more frequently copied than those with a bad sound. Over the years, this resulted in adopting the model of acoustic planning, which rested mainly on imitating successfully designed rooms. The classical concert hall had a rectangular ground plan, in which the size of the space on the one hand and its aspect ratios on the other were decisive for the acoustical character. In the second half of the twentieth century, Hans Scharoun and Lothar Cremer developed the “vineyard concept” when planning the Berlin Philharmonic Hall. The fluently staggered arrangement of the seating area gave the idea its name, but more apt would be the designation “amphitheatre”. The playing areas are located in the lower central space of the performance room and the audience seats ascend around it on all sides. This concept is attractive for the concert hall operator because it can accommodate many more seats. The approach was also welcomed because it dismantled the traditional system of price and quality classes for the seats and, so to say, democratized music enjoyment. In terms of acoustics, however, there are difficulties that need to be compensated. Thus, the sound reflection occurring on the sidewalls of rectangular halls contributes considerably to the sound and engenders in the audience the impression of an enveloping space. In vineyard-style halls there hardly exists a uniform wall surface, so that the supporting sound reflections must be aided by the addition of arranged of reflection surfaces such as parapet fronts of marble. Because of the asymmetrical structure of the rooms, this does not succeed equally well in all directions; at various places a significantly different sound can result. Moreover, in vineyard halls, the point of highest ceiling height lies in the centre above the orchestra, as in a tent. But precisely there a low ceiling is required to enable the mutual audibility of the musicians. As an expedient, the basic form of the room is broken and, as in the Berlin Philharmonic Hall, the Gasteig in Munich and the Elbe Philharmonic Hall, the required reflection above the orchestra is supplied by ceiling sails or the like. So far the competition between the two concepts remains open. Although the outstanding new buildings of the last decades have been designed predominantly in the vineyard style, classical shoebox halls such as the Vienna Musikvereinssaal are still among the best concert halls in the world. So far as can be generalized, it may be said that rectangular halls tend to have a somewhat steadier, musically fuller sound than do the rather diaphanous and clear-sounding vineyard halls. The Elbe Philharmonic Hall, for instance, follows the vineyard concept and develops further the Berlin approach. Compared with the model of the hall in the capital, the one in Hamburg has even fewer large surfaces for sound reflection. Therefore the elaborate design of the so-called “white skin” made of gypsum fibreboard, with 10,287 specially designed, honeycomb-like individual parts, places much greater emphasis on a uniform mixing of the acoustic field on a smaller scale. As in Berlin, the sound reflections from the high ceiling in Hamburg also reach the musicians too late to allow precise synchronization. While on the Spree the hall had to be retrofitted with ceiling sails after a few years, on the Elbe a mushroom-shaped ceiling reflector could already be integrated into the planning, allowing for a precise interplay of the musicians with a predominantly transparent and analytical sound presence. 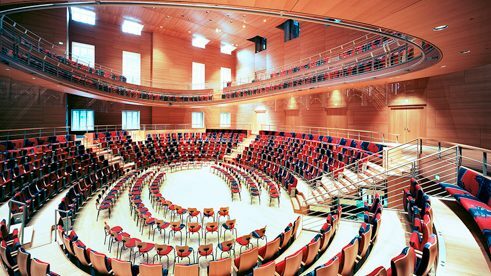 The Pierre Boulez Hall in at the Barenboim-Said Academy in Berlin is a chamber music hall of a special room type, optimized for smaller orchestras. The design – again supervised by Yasuhisha Toyota – is unique. The space stands out in particular because of its almost elliptical basic shape, with the orchestra area in the centre and round about the ascending levels of audience seating. Because of the resulting focal point effect of the sound reflecting from the room walls, this basic form usually results in considerable problems with the sound; here, however, this could be prevented thanks to skilful optimizing of spatial dimensions and targeted production of acoustic scattering. The Carmen Würth Forum in Künzelsau, midway between Stuttgart and Würzburg, was opened in July 2017 and represents a contrast to big city architecture that takes into account touristic aspects. “The built opposite of the Hamburg Elbe Philharmonic Hall” (Laura Weissmüller, Süddeutsche Zeitung, 22.08.2017), it is a multifunctional area, which includes not only a convention hall but also a chamber music hall with 600 seats. The architect David Chipperfield chose for the small hall a wood-clad shoebox form, which produces the effect of a dry, but warmer and more present acoustics. Since its re-opening in October 2017, the Berlin State Opera, anchored architecturally in the GDR, has shone in new splendour. The pre-renovation room acoustics was too dry and had to be supported by electro-acoustic reverberation extension systems. To remedy this, the renovations added a storey and fitted a reverberation gallery below the ceiling surface: “The material of an acoustic network should be light, hard and hardly breakable; the result was an ivory ceramic composite fibre material, which was straightaway registered for a patent and, together with the pleated wall behind, obviously works miracles,” Christine Lemke-Matwey wrote on zeit.de. The Munich Concert Hall | Animation Cukrowicz Nachbaur Architekten ZT GmbH, Bregenz No sooner were the designs for the wining model of the future Munich Concert House published at the end of October 2017 than it already had a name in the vernacular: “glass barn” (Glasscheune) or “Snow White’s Coffin” (Schneewittchensarg). The building, designed by the Bregenz-based office of Cukrowicz Nachbaur, exemplifies the range of choices in modern acoustics. The Main Hall, which holds 1,920 people, will be a combination of shoebox and vineyard, with ascending parquet and surrounding borders, also behind the orchestra. The chamber music hall, with up to 900 seats, has in turn the classic elongated rectangular box form. The decision as to who will be in charge of developing the acoustics, however, has not yet been taken. Mariss Jansons, at any rate, is a big fan of Yasuhisha Toyota, whether for box or vineyard. Johannes Scheller is an expert in room acoustics and tries to make Berlin sound better.